POOLER, GA (WTOC) - A Pooler family's home was seriously damaged by fire overnight. Firefighters say they got the call just before 11 p.m. Sunday night. When they arrived at the home on Winchester Road, they saw the entire second story of the home was on fire with flames coming from the roof. Officials say all four members of the family were inside the home when the fire started, but they all made it out safely. 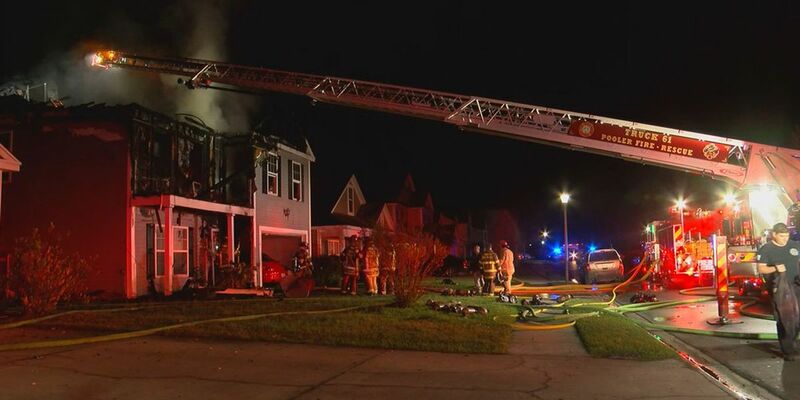 A neighbor noticed the flames when she passed by the house on her way home and called 911. "I saw fire from across the street, and I thought it was my neighbor having a bonfire. And then I came around the corner and saw the flames reflected on my house, and that's when I called the police because no one was outside," said Alysa Rodriguez, neighbor who called 911. The family will not be able to stay in the home for a while due to the amount of damage. We’re told the Red Cross is helping them find shelter. The Pooler Fire Department says that the fire is believed to have been caused by a cigarette.